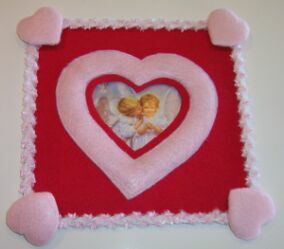 This heart shaped picture frame is something you'll want to make as a gift. Of course, it turns out so great you might not want to part with it once you've spent time creating one. Cut an 8" x 8" piece from both the stiff cardboard and the red felt. 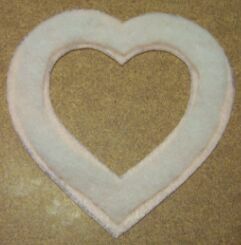 From the pink felt, cut 1 padded heart and 4 border hearts. 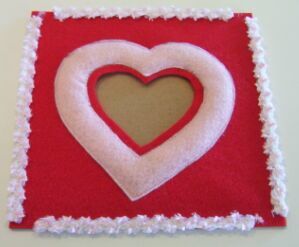 On the 4 border hearts, make a short slit at center top (see the red line on the border hearts template). 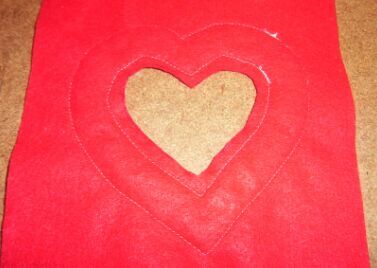 Cut out the center heart from the 8" x 8" red felt. Double up the quilt batting and cut 1 padding template and 4 border hearts. 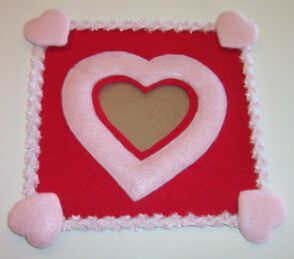 From the pink felt, cut 4 hearts that are 1/4" larger all the way around than a border heart. Spot glue the stuffed heart batting onto the stuffed heart cutout. Center the pieces onto the red felt, carefully "framing" the center heart cutout. 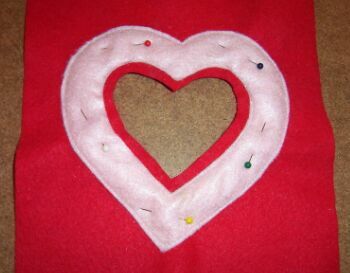 Pin in place and stitch both inner and outer edges of the pink heart all the way around. Cut 4 pieces of decorative trim and glue it to all 4 outer edges of the red felt. 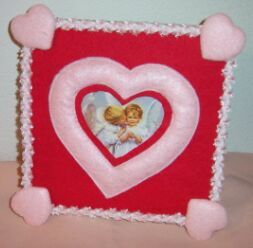 Create 4 padded corner hearts. 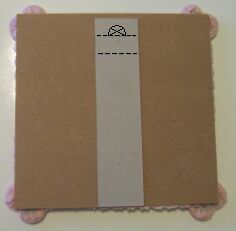 Start by putting the cardboard, padding, and felt together (1). On the wrong side, stitch back and forth across the heart (2). Continue stitching back and forth until all the edges are completely secured (3). Hot glue the 1 finished heart to each corner. Insert a picture through the top opening between the red felt and cardboard. Cut a piece of stiff cardboard 1-1/2" x 7-1/2". Referring to the picture below, draw dotted line A, 1/2" down from the top edge. Draw dotted line B, 1-1/2" down from the top edge. These are the fold lines. If you plan to hang the picture, draw and cut out a half circle, centered just above line A. 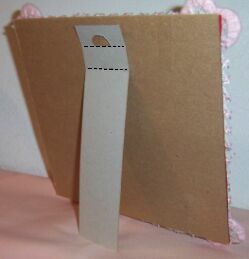 If you plan to stand the picture, fold the display leg outward slightly along line B. Spread glue between lines A and B and position the "leg" on the back of the picture frame, centered and flush with the bottom edge. Allow the glue to dry.